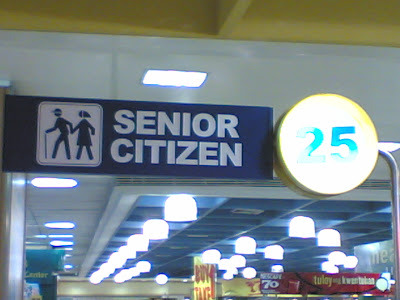 Senior citizens are left out again in the 2010 Budget. The PM has delivered his 2010 budget speech. No mention whatsoever was made of any allocation to meet the needs of the older people. On the other hand, the PM’s wife, Datin Seri Rosmah Mansor’s Permata programme was given a boost of RM100 million allocation in recognition of the importance of early childcare and education in Malaysia. What about the importance of elderly care and the training of caregivers of the elderly? 1. Well-run community centres which have social activities for older people. The community centres in Singapore can serve as good models. 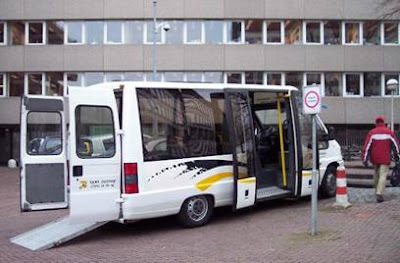 An elderly-friendly shuttle bus with a ramp for easy wheel-chair access. Note the low step to board the bus. 2. Good public transport, including shuttles to take the elderly from their home to important destinations. Bus drivers should be trained to show some respect and courtesy to elderly commuters. The 50% off fares should also cover LRT and monorail, and not just RapidKL buses. 3. Adequate elder-friendly public housing with ramps, railings and non-slip flooring. Also an outdoor exercise gym. The government should make it mandatory for all housing developers to provide elderly-friendly facilities too. 4. Safe environment – well-lit streets, easily visible street directories and more police patrols. Uneven pavements and paths should be immediately resurfaced. 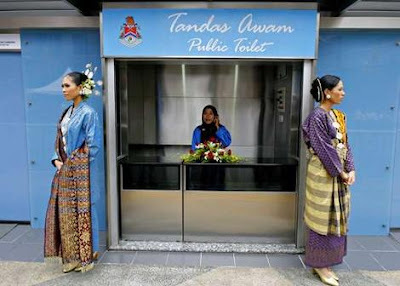 I wouldn't mind paying RM1 to use a public toilet like this one! Alas, they are harder to find than a lottery ticket with the winning number. 5. More clean public toilets, with separate ones for the elderly. The long queues especially in the ladies toilet often mean an agonizing wait for the elderly. 6. More lifelong learning centres offering courses at a discount for senior citizens. 7. Special queues at service counters in hospitals, post offices and other government buildings. This costs next to nothing to implement. The private sector i.e. banks, supermarkets, cinemas, should follow suit. Left: Sign at the Tsao Foundation, Singapore. 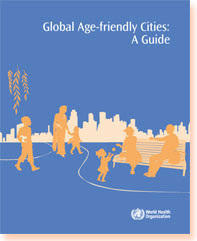 Right: WHO's Guide to Age-Friendly Cities. 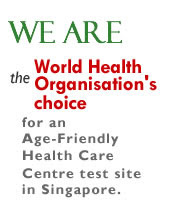 In 2007, the World Health Organization (WHO) initiated a Global Age-Friendly Cities Project in 33 cities in 22 countries. Pity Malaysia is not one of the participating countries. I fully agreed with all your suggestions.